Leonardo da Vinci’s Mona Lisa is the most famous painting of all time. It also holds claim to the largest insurance valuation for a painting in history. In 1962, when the Mona Lisa went on tour from Paris France to Washington DC and New York City, The Louvre assessed the cost to insure the painting for the duration of the trip. The valuation at the time was $100,000,000. Ultimately, The Louvre declined the insurance as the premiums to insure the masterpiece were greater than the highest security precautions available. Today the Mona Lisa sits comfortably on display at The Louvre inside a sealed enclosure of 1.52″ think bullet proof glass and a permanent interior temperature of 43 degrees Fahrenheit and a consistent 50 percent humidity. With over 9,000,000 visitors each year and the Mona Lisa being the most popular exhibit in the Louvre, there’s no question the painting warrants some serious protection measures. da Vinci’s Mona Lisa is secured inside an environmentally protected enclosure including nearly 2 inches of bulletproof glass. It’s unlikely that you or I will ever require such extreme protection measures for our valuables, however anyone in possession of valuable artwork would be foolish not to expend some extra effort to protect it. A good home security system is a good start, however a smash and grab-type burglar who knows what he’s after isn’t likely to be deterred much by an alarm. Once that valuable item is stolen odds are that it’s gone for good. This is where insurance comes into play. A standard homeowners insurance policy provides little protection for damaged or stolen valuable items. Never assume that your home insurance is going to properly cover you for valuable works of art, jewelry, furs or other valuable collections. The proper way to insure these items is specifically insuring each of these items on a valuable items schedule. Often referred to as a “rider” or a “floater,” this form of insurance not only insures specific valuables at predetermined limits, but it broadens coverage to include losses that would not ordinarily be covered on a homeowners insurance policy. When specifically “scheduled,” coverage options include mysterious disappearance and breakage. Additional coverage options may include an “agreed amount” or “appraised value” coverage. For more information or to obtain a quote to properly insure your valuables, contact a member of our team at Fitts Insurance. We’ll be happy to take the time to explain your coverage options and place this valuable coverage for you. Roughly two million burglaries occur each year. Protect your home and family when you implement five landscaping tricks that don’t compromise your home’s exterior appearance or value. 1. Place Hostile Plants by Entryways Burglars typically target easily accessible windows and doors. By placing hostile plants loaded with thorns, briars and brambles near these entryways, you discourage potential burglars. Several hostile plants to consider include roses, holly, raspberries, bird’s nest spruces, needle bushes and Spanish bayonet. 2. Trim Shrubbery Near the House Overgrown shrubs, bushes and flowering plants look untidy, and they give burglars plenty of places to hide. They also prevent neighbors and anyone on the street from seeing suspicious behavior near your home. Protect your home when you keep shrubbery trimmed to lower than three feet tall all along the exterior of your home. Remember to trim plants away from the sides of your home too. 3. Use Noisy Ground Cover Burglars try to be as quiet as possible, but noisy ground cover around your windows and doors alerts you to their every move. Pea gravel or other crunching stones do the trick, and you can find these burglar deterrents in colors that match your existing landscaping. 4. Install Short Privacy Fencing Tall fences and tree barriers increase privacy, but they also obscure burglars. Install short fencing with an open design instead. If you already planted trees or shrubs, trim them so that the canopy starts at eight feet or higher off the ground. 5. Turn on the Lights Most outdoor landscaping includes lighting of some sort. Opt for strategically placed motion-activated lighting as you reduce your chances of being burglarized. Place these lights near all your doors and windows and along pathways. They frighten burglars away and warn you when someone walks near your home. 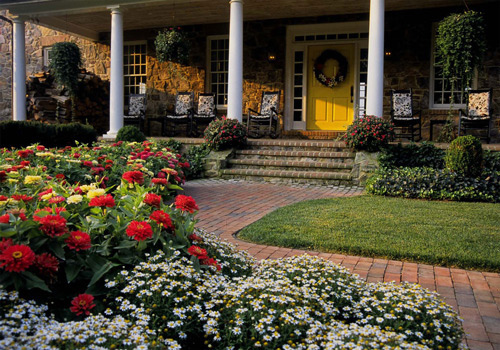 Your home’s landscaping adds beauty and value to your property. It also deters burglars. Talk to your insurance agent today and discuss additional landscaping tricks that deter burglars and protect your home. You and your apartment, dorm or house mate might share living expenses, but you each need your own renters insurance policy. It’s an investment that replaces your possessions if they’re damaged, stolen or lost. Learn why this $15 per month policy is an important part of your living arrangement. Whether you and your roommates are strangers, best friends or cousins, purchase separate policies. Most renters insurance companies won’t include two or more unrelated people on a policy, so be an individual and purchase your own policy. Maybe you and your roommate get along great until you have a big fight and he or she deliberately damages your valuables. If that happens and you and your roommate share a policy, you won’t receive a payout to replace the damaged item. Let’s say your roommate’s car is vandalized. Your combined policy pays the claim, but since your name is also on the policy, your ability to purchase affordable insurance is negatively affected for the next three to seven years. Separate policies protects your future insurability. Joint insurance policies include payout checks made out to both parties. So when your valuable electronic equipment is stolen, both you and your roommate have to sign the check. Purchase separate coverage to ensure you receive the full amount you’re due. When a visitor trips or falls and decides to sue you, renters insurance can cover the liability. Slander and libel may also be covered. Have your own policy to cover your liability. Despite purchasing separate policies, your renters insurance might include financial limits. Discuss coverage caps with your insurance agent to ensure your vintage guitar or art collection is covered. You don’t know how much your possessions are worth until you create an inventory list. Then, purchase replacement value coverage. Although it costs about 10 percent more than cash value coverage, it allows you to replace the damaged, lost or stolen item at its current cost rather than the purchase price minus depreciation. The decision to share living space with an apartment means you share expenses too. Make sure each roommate purchases a separate renters insurance policy, though, as you protect your possessions. One Saturday, Jenny stopped by the mall for some afternoon shopping. The parking lot was packed, but she found a space at the very back of the lot. After she ate some lunch and shopped for a few hours, Jenny strolled back to her car—only to find that her passenger window was broken, and her laptop and iPod were missing. Her heart plummeted into her stomach, and she wasn’t sure what to do. If you’ve ever walked into a parking lot or your own driveway to discover a thief has broken into your car, you’re probably all too familiar with that terrible sinking feeling. Fortunately, there are some steps you can take to stop car robbers in their tracks. These criminals go for the simple jobs, so they usually choose vehicles that are parked in remote areas and have valuables in plain view. There’s been plenty of warning in the media about security risks associated with various social media sites and the types of posting people do on them. One major security risk is the “Check-in” feature on facebook. Simply put, people should never use this feature.